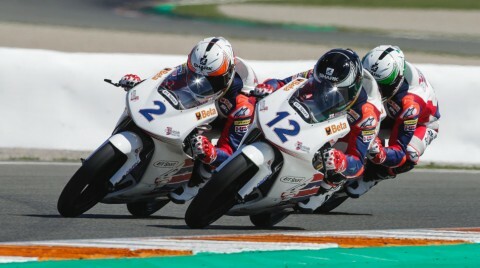 Scott Ogden went quickest in the two-day British Talent Cup test at the Circuit Ricardo Tormo in Valencia, but it was incredibly close at the top as Cameron Horsman was just 0.013 off in second – something that bodes well for another competitive season as the Cup heads in to its second year. Dry weather greeted the grid in Valencia, allowing the field to get a useful full two days running ahead of the season opener later this month. Behind the duelling veterans at the top, third place went to Fenton Seabright, fresh from a podium in the European Talent Cup, as he ended the two days of track action just over a tenth off. Seabright took a podium from pitlane in 2018 and was just 0.125 off to start the new season. Jamie Davis and Jack Hart were only a little further back and close together, and they locked out fourth and fifth, ahead of Brian Hart in sixth and Charlie Farrer in seventh. Irishman Rhys Irwin, Jack Nixon and Charlie Atkins completed a top ten of familiar names covered by 1.2 seconds. Next up was Torin Collins, who took P11 and was the fastest rookie on the timesheets. He got the better of Elliot Pinson, with 2018 veteran Scott Swann down in 12th, one of those who’ll be looking for more once racing begins. Rookies Jamie Lyons and Edward 0’Shea completed the top 15. As is to be expected with nearly half the field getting their first taste of their British Talent Cup machinery – and the Circuit Ricardo Tormo – there were a number of crashes as they got up to speed. However, the only rider declared unfit at the test was Zak Shelton, forced to sit out the remainder of Day 2 after a crash. That’s it from the first track action of 2019, make sure to watch the season opener as the British Talent Cup race alongside BSB at Silverstone on the 19th – 21st April.